Louie’s Place offers a menu that has a combination of classic American food and creative twists on the same. It is open for breakfast, lunch and dinner and has something that everyone will want to try! I am not a huge fan of breakfast food- most of the time it’s because I think it’s pretty boring. Cereal, toast, an egg…. sometimes it just doesn’t do it for me. Louie’s Place offers a one of a kind breakfast item that I know is going to make it big. 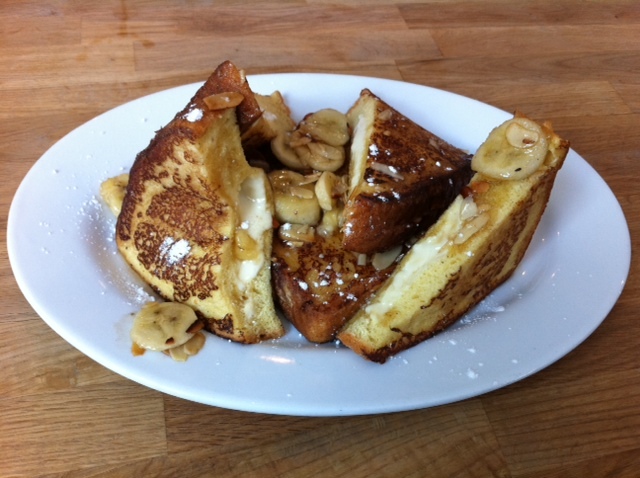 HELLO French Toast Stuffed with Brie in a Banana Almond Syrup!